Invision Sally Jobe, Denver, Colo. 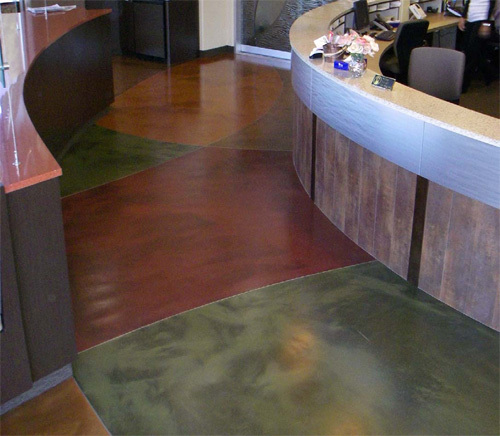 Contractor: Concrete Revolution, Denver, Colo.
To greet visitors to a new facility, the Invision Sally Jobe radiology center in Denver, Colo., was looking for an aesthetically pleasing reception desk featuring a concrete countertop. They weren't looking for anything flashy, and felt that concrete would be the perfect subtle material. The clinic's architect hired Denver-based Concrete Revolution to do the work. The wave effect designed for the front of the countertop does more than just please the eye. "It's actually a functional element," says Concrete Revolution owner Allen Miller. "They create individual areas that patients come up to and stand in." To develop the waves, Concrete Revolution was provided with a template fashioned by a millwork company and preapproved by the architect. Miller then constructed a mold using the template, and created the countertop using a wet-cast method and black integral pigment. To complete the look, he gave it a very light grind to expose a small amount of aggregate. "When you look at it, it has some flecking and mottling," he says. "We only removed a tiny, tiny bit. Probably less then 1/32 inch was removed. " 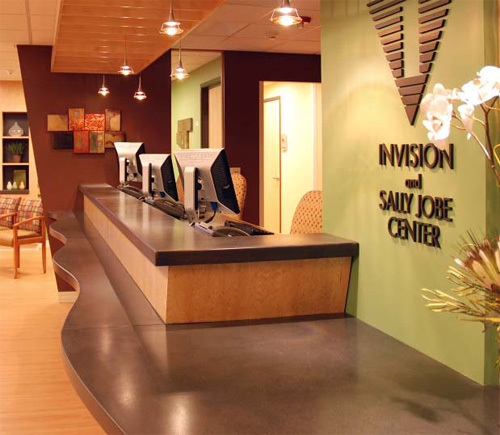 The end result was just what Invision Sally Jobe was looking for, and since then Miller has completed several other reception desk countertops for them. North County Oral and Facial Surgery Center, Escondido, Calif. Contractor: Coating Pros, Temecula, Calif.
For Kevin Ross and his crew, the North County Oral & Facial Surgery Center project is remembered well - partly thanks to an intruder and a police canine, but more on that later. During the spring of 2009, the medical center was looking to build a new facility. Project designer Janet Petterson of Fallbrook, Calif., firm Design Waves contacted Westcoat Specialty Coating Systems, who in turn contacted Ross's company Coating Pros to work on the 800-square-foot lobby and other high-traffic areas. To start construction on the lobby floor, Coating Pros shotblasted the existing slab and ground the surface around the wall edges. After vacuuming up the dust, Ross applied Westcoat's EC-12 Epoxy Primer, followed by EC-72 Epoxy Patch Gel to fill in joints and cracks. The project's design called for four sections of color. To separate the areas Ross and his team installed metal terrazzo strips for a high-end look. Next, they poured Westcoat's Liquid Dazzle Epoxy in Sunset, Cafe, Jade and Ruby. Each area was given a light sanding to remove any high spots, then sealed with EC-96 Satin Polyurethane Topcoat. In addition the floor was given a coating of Westcoat wax. While many projects have unique challenges to overcome, Ross and his crew had to deal with something particularly off the wall. One evening, after one of the Liquid Dazzle colors was poured, the building's security alarm was triggered, dispatching police. "We believe someone tried to enter on the roof, " Ross says. Officers entered the building and sent in a canine to find the intruder. Although nobody was found, the dog ran through the wet Liquid Dazzle and onto freshly installed carpet during the search. Ross was called to the scene, and he wiped down the dog's paws with solvent before having them professionally cleaned at the vet. Thankfully the dog is fine, and any damage to the flooring and carpet was easily fixable. "We're very proud of this job, " Ross says, adding they use photos of it in their marketing campaign. "In the end it turned out really well. " Oklahoma Allergy and Asthma Clinic, Oklahoma City, Okla. Contractor: ADC Hardscape Artisans, Edmond, Okla.
To serve as the focal point of their lobby, the Oklahoma Allergy and Asthma Clinic wanted a reception desk graced with a one-of-a-kind countertop. They designed a concrete countertop that incorporated soft lines and soothing green hues, which they figured would give the space a homey feel. The round, seamless countertop features integrated transaction towers and a channel rail for dim lighting under the front lip. The original plans called for ADC Hardscape Artisans, of Edmond, Okla., to develop a countertop 10 feet in length and 2 feet deep that would be supported on only one side. To accomplish this, ADC owner Donnie Price constructed a piece only 1 1/2 inches thick using poured-in-place technology and getting assistance from plasticizers and fiberglass strands for strength. 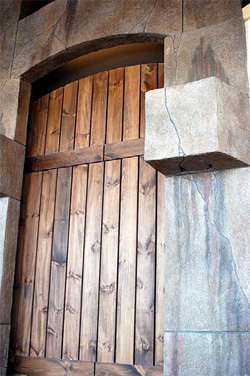 He used a green integral color and applied green and light-tan acid stain accents. The whole countertop was sealed with a polyurethane sealer that Price applied with a rough finish by tweaking its viscosity and applying it with a roller, though he is quick to note that it's still smooth enough to serve as a writing surface. "The results are simply stunning," says Price. "It's a fully functional piece that adheres to the demands of the architect, project manager, superintendent and interior decorator, but most important of all, the client." While the piece could be supported on only side, Price says, the clinic strayed from that design element and opted for additional storage under the countertop instead. In addition to the front reception desk, Price was also responsible for creating a precast countertop for the coffee service area, complete with holes for a sink and a trash receptacle. To construct that piece, Price mixed both white and gray cements and applied acetone dyes to create a reddish-brown countertop. It was sealed with a polyaspartic sealer. Both pieces have enjoyed a positive response, Price says. "I really think we're going to see more of a demand for these. " Li'l Teeth Dentistry, Aurora, Colo. Many children have a fear of the dentist, but for the patients at Aurora, Colo.'s Li'l Teeth Dentistry, that semiannual teeth cleaning has become a whole lot more fun. Dr. Andre Gillespie hired architect Paul Battista of Battista Design Group to create an atmosphere at Li'l Teeth that would encourage children to look forward to coming to the dentist. Since he wanted to appeal to children ranging in age from 2 to 14, Dr. Gillespie wasn't interested in cartoonish decor. Instead, he was hoping for a realistic dinosaur theme. With that in mind, Battista met with Colorado Hardscapes Inc. in Denver to figure out the logistics. "He came down to our office with a layout of the building and we discussed the process of shotcrete, staining, and other ideas, " says Colorado Hardscapes business developer Karen Van Heukelem. "He saw our design center and got some ideas about what was possible, and he started to get really excited. " Several months later, this ordinary strip-mall dentist's office looks like a set from "Jurassic Park. " As patients walk in, they are met with artificial flickering flames inside concrete light boxes atop faux stone columns on either side of a large wooden gate. 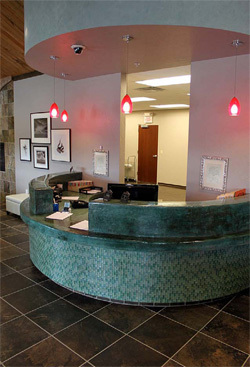 The reception desk sports a primitive look thanks to a faux stone finish on its face that was stamped with a texture mat and hand-carved. The concrete floor was treated with a low-grit polish and stained with Bomanite earth tones. A T. rex footprint was imprinted in the floor using a blast mat fashioned after a template from Battista. The imprint was sandblasted, then stained a contrasting color. The footprint leads kids into the rest of the office. A giant rock feature reminiscent of a fossilized dinosaur egg greets patients in the X-ray room. 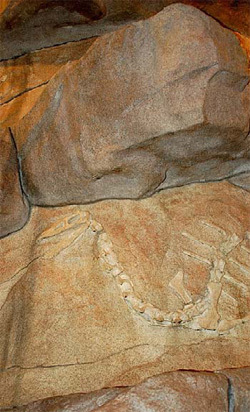 Doors to the storage room and a nearby closet have been given an artificial rock treatment to help them blend into rock features on the adjacent wall, where fossils from a raptor and other creatures have been cast into the surface. 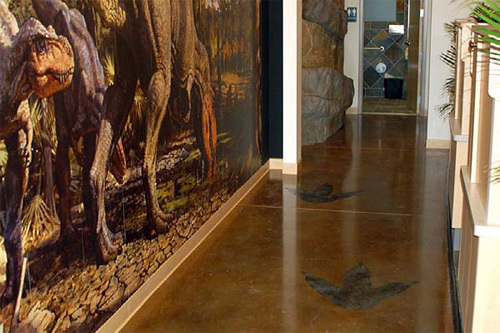 Wall-to-ceiling murals, stamped raptor footprints and additional light boxes complete the prehistoric experience. Naturally a project of this scale is going to have a few challenges along the way. One such challenge was getting the large dinosaur egg into the office. In order to get the mold through the door and hallways, it had to be created and brought into the building in four pieces. Sculpted shotcrete and texture mats were used to achieve the desired texture and feel of the egg as well as the rocks it sits on. "The project went very smoothly, " says Van Heukelem. "Both the owner and the architect are very happy. "